The False Creek Watershed Society acknowledges the hospitality of the Musqueam, Squamish and Tsleil'waututh First Nations, on whose ancestral and unceded territory the watershed is located. We invite you to attend a special walk along the False Creek Seawall. We are very fortunate to have Candace Campo of Talaysay Tours as leader. She will be discussing the water and land from an Indigenous point of view. Even in an urban setting, the natural elements come through. Please register for the walk at this link. This event will fill up quickly so register soon! The cost is $15.00, cash, cheque or Visa accepted on Feb 3. Our AGM will take place afterwards at the False Creek Community Centre. We will be discussing the past year's activities and electing the new Board. We will also have our new "Nature in Stratchona" Art Maps available for sale (please bring a bag) and The Remembering Brewery Creek website will have a "soft launch!" The AGM event is open to the public. You are welcome to RSVP by responding to this email. We encourage you to join our non-profit society. This will enable us to continue our work to promote watershed awareness and environmental sustainability. We are the only watershed group in Vancouver specifically focused on these goals - in a city surrounded by fresh water, sea water and graced by high rainfall! Video on Lost Streams of Vancouver - take a look! 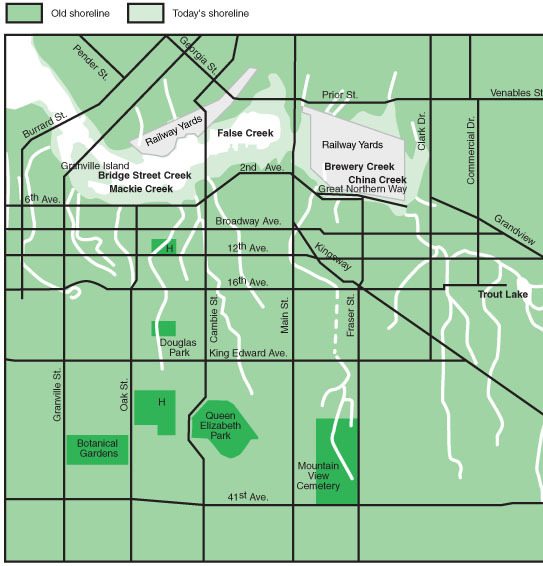 The Nature in Strathcona Map is now available. Send us an email for a copy. Also find out about the project here. Hemlock , south shore - 1886/ looking N over False Creek. The log's diameter is estimated at three metres. Mount Pleasant "Rainway "is a group working to daylight Mount Pleasant's creeks and reconnect to a biodiverse ecosystem. Would you like to be on our newsletter list or volunteer?